Nobody saying Happy Christmas yet? Oh. Well, while we're waiting, let's see how others currently celebrate Christmas, back in the past. Ah, 80s-ana. Takes me back to school and all the paperweight decorations littering all our classrooms, only up a few days before being destroyed, so we could all enjoy making more the next year. And I don't think we even noticed. And before the golden age of the Commodore, typewriters were whatever it was that was good. Well, more in the way of useful. Even they have Christmas, so they must have been pretty OK. Well, good enough that mine still comes in handy for quick labels and such. And you know you have your rose specs on when you realise we came along just as advanced electronics truly put comercialisation at the rightful heart of Christmas. 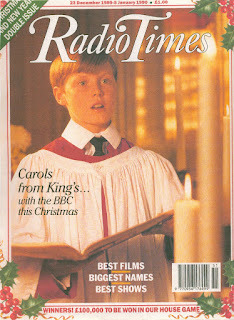 So Merry Christmas, happy gaming and I'll leave you now with the wonderment of Christmas '89. I don't miss the childhood Christmas excitement though. Kept me up half the night. Merry xmas from a newbie. @The Von Braun: I've never seen such activity on this forum since the last time someone tried to sell us Vuitton handbags! Fantastic. And with this new blood, I have an idea. Anyone fancy putting some of this really retro music on the Commodore? Y'know, Zadok for George III's wedding and stuff. Well only the most regal tracks for our iconic Commies. There was an episode earlier. The whole thing probably should be as interesting as Howard Goodall's History of Music. Everyone seems to 'do' Facebook and Twitter these days, leaving forums somewhat neglected. ...And Happy New Year to everybody. I'm Thing on a Spring and I approve of your message! A bit late for Christmas, so Happy New Year to all of you and yours, my fellow retro-ians!